Welcome to my first annual Five Days of Holiday Giveaways! Be sure to read allll the way to the end for an awesome contest opportunity! First of all, are you diggin' how I decorated for the holidays? Who says snowmen and flip-flops were mutually exclusive? It's time to celebrate with a week of fun and freebies! First up is a cute math game called Reindeer Dash. It's amazing to me that I keep creating these math games. I h-a-t-e-d math for the longest time and now I'm fixated on making math fun for my kids. I guess I just want to be sure they don't turn into a math-phobe like me! So, enough with the rambling. In this game, the kids roll three dice and first identify the two highest numbers. They add those numbers and then subtract the remaining number. So, if they roll a 6,4 and 5 they would add 6+5, then subtract the 4 and their answer would be 3. They would then cover the 3 on their side of the board. You have no idea how long it took me to figure out the possible answers for this game. Then when I was telling my friend my tale of woe and showing her all my scrap work, she rattled off the answers as if it was the alphabet. I need to be playing my own games apparently. Click on the pic to download the game. Hope you like it! Here's the big contest announcement! 1. A year's worth of my Weekly Word Wizard Language Arts activities. 2. A year's worth of my Smartboard Calendar math files. 3. A year's worth of monthly writing prompt center task cards. 4. My Tasty Tuesday year-long writing program. Notice the theme there? 4 YEAR-long resources for you! (if you're the lucky winner of course) Here's how to enter. I tried to keep it super simple. You don't need to click here, there and everywhere. Just leave a comment on THIS post to enter. I'd love to hear what you like about the blog or want to see more (or less) of or some such useful information, but if you just leave a comment that says, "I follow you" that counts too. There is one way to add a bonus entry. Pin my reindeer button down below to Pinterest or add it to your blog to spread the word of the giveaway days, then come back and leave another comment saying you did so. Simple enough, right? Entries must be received by midnight EST on December 5, 2011. Winner will be announced here on December 6, 2011. *If those resources don't float your boat, you can pick other prizes of the same monetary value to fit your needs. You can start entering the contest today and be sure to stop back every day from now until December 5th for new freebies! I love your blog! I am a fellow Floridian teachers, totally dig the snowman and flip flops! I don't know that there could be just one thing i like about your blog, everything on here is so much fun and festive. I homeschool my second grader and find all of your freebies super useful and fun for her to learn while having a good time! Thanks for all you do. I love your blog too!! I especially like Tasty Tuesdays. I think my students will love it! Thanks! Pinned the reindeer! Like Tanya said far more than one thing about your blogs that I like. I really like that you post useful, fun, and creative ideas that can be used in more than one grade level. Children love games and you create a lot of them and have great things for early finishers as well! Thank you for sharing your ideas!!! Love the game...and love your blog! Thanks for sharing! I'm a follower of you and your tpt store. I love your items! I've purchased several things and love them all! Great giveaway!!! I really like when you shake up a lesson we've all seen before (like the Thanksgiving one) and that you show a lot of pictures. Thanks for all you do! I follow your blog. Thank you so much for sharing your creative talents. I pinned your reindeer button on Pinterest last night, and I shared the link on Facebook. Those are AWESOME prizes you're giving away. Love your blog! I, like you, hated math. It is now my second favorite subject to teach (aside from writing). I love to make games for the kids to spice things up. I have used some of yours for some review, or borrowed your idea and added a twist to fit my third grade curriculum! I would love to win your pack especially since I am getting an interactive board soon!! Love your blog and great ideas. No need to change anything! Love it all. I love everything about your blog. You passion, motivation, and quirky sense of humor. I LOVED the story about the sweet potatoes. That SOOOO hit home ;0) Although I didn't cook rotten potatoes (yet). 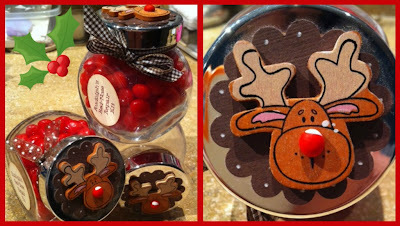 Oh I love the cute little reindeer repair jar! That is adorable! Your blog is great too by the way! I shared your giveaway on my blog and also used your button. Thanks! Your blog and creativity continue to amaze me! I need the vitamins that you take!! I love your blog!!! Thanks for sharing the too cute Rudolph gift idea!! I am definitely going to do it this year!! I am an "old first grade teacher" returned to a newbie after 12 years as a reading specialist and third grade teacher! I love your posts and excitement about teaching! It helps me stay excited too! Thanks!!! Just placed your reindeer on my Pinterest board! I love your blog! I shared it just today with coworkers. I pinned your reindeer on my Pinterest board! I love your blog, also and also teach in Broward County. Your math games are perfect for centers! Love your blog! Love your freebies! I'm impressed by your creativity and grateful that you are such a good sharer :) Happy Holidays! I love your blog- and I teach 1st grade :) I learn so much from teachers who are so giving with their brilliancy!!! Thanks so much! I love your ideas! I am also borrowing your reindeer nose kit idea for gifts for my team, it's cute and inexpensive ! I pinned your reindeer button and your reindeer nose repair kit using pinterest. I LOVE and follow your blog!!! I follow your great blog!!! I would really love to win! Speaking of love, your banner at the top with the snowmen and flip flops is very cute! I'm in South Florida also- nothing like shorts and Tshirts on Christmas day! I follow your blog AND I pinned the giveaway picture on Pinterest! Thanks for all your cool games! Just pinned your reindeer on Pinterest! I enjoy your blog. I like how positive and upbeat you always are. You have inspired me to start my own blog!! I hope to start over Christmas break! Your happiness shines through your blog and got me excited about teaching again! Thank you!!! I follow your blog! I also love your creativity! Thanks for all of your fabulous ideas, you are very inspiring! Just wondering if you ever sleep? I love all your creative ideas! Keep em coming! Pinned it as well! Love your boards! You're right! Everything does look better decorated. I just do not have the technology skills that you do to make everything look pretty. I love using your pretty products with my class! You are too kind!! I love the things you create and share! I was very excited to try your Tasty Tuesday writing this year, but unfortunately I have some pretty severe allergies in my room this year....maybe next year!! I hope I win!! I also pinned your little reindeer for the giveaway!! You have been a life saver to a new-to-second-grade teacher this year! Thanks for all your ideas! I love your blog. You always have awesome games and ideas. Thanks so much for sharing. You are so incredibly talented!! I love, love, love your ideas and creations! Thank you so much for sharing them with us! Blessings to you! I pinned your cute reindeer. My email is d.faust@yahoo.com just in case I win. Ha!! I love your blog and have been following you for awhile. I appreciate your contributions to my classroom! Thanks for sharing your great ideas. Im in my first year...I need it!!! Thanks so much for sharing all of your wonderful ideas. They have helped my class so very much! How neat! My 2nd grader struggles with Math so I really appreciate all the tips & ideas to help him. Such wonderful ideas!! Thank you for sharing all of the amazing things you have created! I follow your blog. Thank you for sharing the math game! I enjoy your blog a great deal!!! I follow you here on the blog as well as on FB. I love your blog and check it almost every day. Keep up the great work!!! Happy Holidays! I am a HUGE fan of your blog!!! Thank you for the inspiration & awesome ideas. I check your blog all ll the time. Thanks for the great giveaway! Love the reindeer! I am always thrilled to find crafts that make everyone smile. Ideas for bridging literature with math are also much appreciated. Thanks! Love your blog! Like you, I hated math ALL through school (even college), but I absolutely love teaching math now. I try daily to make math fun and memorable. Thanks for the freebies and new ideas! I love your blog too! I check it a couple of times a day! You are so creative. My students have loved your activities. Thanks so much for all you do and share! I am a fan of your blog and I have used many of your ideas in my own classroom. Your sense of humor keeps me coming back! Thanks for all of your hard work and dedication! I can always count on finding something on your blog. I pinned your reindeer pic too! THANK YOU! I truly love your creative and artistic lessons! You inspire me daily and I have told my teaching partners about your blog. You have been blessed! Thank you so much for sharing! Sorry, made a Huge typo - hate that as a teacher. What I tried to say was I've really enjoyed the math games I've gotten from you. Thanks for doing all that hard work! I love your blog! Thank you so much for sharing all your neat and creative ideas. I LOVE your blog! It makes me smile each time I visit. :o) I am definitely a follower! Your blog is awesome! Thanks for all the great ideas and freebies!! I have recently become an addict... ADDICTED to YOUR BLOG! I have also recently been PINNED... Well, I am going to try to now figure out just how I am to pin a pic to my own Pinterest page. HAPPY HOLIDAYS! I have been following your blog for a couple of months and I LOVE your creations! I am like you when it comes to math so I am very much appreciating the fun math games. Thanks so much for all you do! I follow your blog because you have such wonderful ideas. Thanks!! I have been following your blog since I became a teaching blog addict this summer! I have also visited your TPT store and purchased some of your great items! Thank you for sharing your teaching talents! I teach Second Grade too and love following your blog. Thanks for your sharing. My students LOVE the addition bump game. They have been playing the Thanksgiving one happily...'saving' the gingerbread one for next week. They will think Santa came early! I love your blog. You have given me such great ideas. Love you blog! We are loving your elf on the shelf resources!! I stumbled across your blog in October and have been a follower ever since. I reading teach grades K-5. My students LOVED the Turkey Scoot game for Thanksgiving. They went home and shared all sorts of great facts with family members! Thank you, Thank you, Thank you! *I am a reading teacher for grades K-5 :) I should proof read before I post! thank you for helping me with these great ideas! I LOVE your blog!!! You have fantastic ideas. I am not a teacher yet (student teaching next semester and hopefully a job this fall...) but I love finding great ideas on your blog for when I actually start teaching. Oh, and pinned the reindeer as well. Oh yes, I'm a follower. I follow your blog and look forward to your posts! I would love to hear more about your experiences teaching gifted children. I follow your blog and really appreciate you sharing your ideas and talents with me! AND I pinned your reindeer - two chances to win - Wahoo!! Yay! I'm finally allowed to post a comment! Thank you so much for sharing all of your great ideas! You are amazing! Your blog helps make teaching fun again! Thank you for your tiime and effort! I love your blog and all your creations! Thanks for sharing. I'm a follower and I love all of your stuff!!! You are one of my favorite bloggers! Love your products and your ideas. Thank you for making my job easier and more fun! I am a new follower! I got here via Pinterest where I was looking for crafts to make with my children (my own "personal-take-home children" lol...love the reindeer red hots! I always have them make presents for far away family....I think it means more when they open a package from far away that isn't just a wrapped something from the same store they have down the street! I know relative we are making the reindeer nose kit for.....but I have to go to Hobby Lobby.....they shut down our Michaels like 10 years ago!!! I pinned the clip of your 5 day contest! Thanks for sharing. My kids loved the Turkey Bump addition game, and I can't wait to show them one for multiplication next week. I love your freebies and because I new to pinterest, I've just started following you on pinterest. LOVE your freebies! I am new to pinterest and I am following your boards. Hi, I love your blog and am going to start following it although I moved from 2nd to 1st this year! :-) THANKS! Love your blog, which I found through Pinterest. I teach 2nd grade in Florida too. So grateful today for warm and sunny outside recess! I visit your blog often! your ideas are awesome. Thank you for sharing. Of course I follow your blog!!!!! And I love all of the stuff you share . . . don't change a thing!!! I love your blog! The math games are great :) Thanks for sharing all your great ideas! Denise, you have a passion for teaching and a love for sharing. Thank you for your dedication, cute crafty ideas and all your freebies! My computer was stollen with all my files and your blog is saving the day! Thanks! So many great ideas -- and easy to use! Thanks for sharing!! Such a cute reindeer! Thanks for sharing your craftiness, along with your other free goodies. I love your blog. Your blog is is an excellent resource. Thanks for all you do! I love all your ideas!! Found your blog late this summer and follow it faithfully thanks so much for all your great ideas. There is something I would love to see more of.... For the craft-challenged person that I am, I would love to see up close pictures of your craft room / craft wall and how you & your hubby organized it! I pinned your contest as well as the great craft ideas! I follow your blog. You have such creative ideas. Your students are so lucky to have you. Love your literature ideas. Your craft ideas are wonderful and very easy to create. Keep it going. I think this is great!! Thanks! We have your blog on our blog roll. Thanks for all the freebies and the good craft ideas. I follow you on Facebook and love your blog. You have the cutest resources and I'm always checking for new ideas. I also just pinned it to my favorite blogs to follow! What a super giveaway :) I already follow you! I have followed your blog for a while now. I love your word work and you have great ideas. Thanks for all the freebies! I pinned your button! Hope you gets lost of new followers and looksies! I pinned your button, not just to win your fabulous prizes, but because I think you have awesome stuff!! Thanks for sharing all your hard work. Just found your blog and I love it! Great freebies. Your blog is wonderful! I love what you said about math...and how excited you are about making it fun for your kids...I feel that way as well. Math was ALWAYS so hard for me....I want to be able to help my kids to avoid that struggle anyway I can! Many blessings! I'm a first year teacher and new to blogging. I just found you and I've spend a good chunk of my day reading about your amazing ideas. Thanks for sharing! Love, love, love your games and ideas! What joy it would be to have year long resources! Fingers are crossed! I have pinned your reindeer to my Pinterest board (pinksmyink). I love your blog and all the fantastic ideas you so generously share with the rest of us. Thanks so much for all you do! I love your blog, the scoot games, and fun math games you generously share! Thanks for the fun holiday freebies! You're so sweet to give them all away. I love reading all these blogs to give me ideas, especially being new to the primary grade scene. I'm loving my 2nd grade experience, though, and think I just might've found my niche. I love everything about your blog!! I just finished my intership yesterday and have referenced your blog several times for writing ideas!! I too am a fellow Floridian!! New to the blogging world. Found one of your activities on Pinterest. Looks like you have a lot of really good stuff. I just returned from maternity leave and am so glad I discovered your blog! Your fun activities are making my transition a little easier! Thank you so much for putting all of this together! I download all your freebies. Thanks so much! I am a substitute teacher right now, but hope to be full time. All of your resources are very helpful and can be used across all grade levels! Thank you for everything that you do!! I follow your blog as well as all of your resources that you post on TPT. What I love most is your sense of humor and wittiness (in addition to all of the wonderful work that you do!) I couldn't even imagine anyone not wanting you're giving away. Your comment: *If those resources don't float your boat, you can pick other prizes of the same monetary value to fit your needs. * is CrAzY! Your resources & ideas float, launch, fix, and shine my boat as well as put the wind in my sails...! =o) Thank you! I love coming on here to not only get some amazing & innovative resources for my little monkeys, but also I love the breath of fresh air you bring to "teaching the skills"...not to mention, your sense of humor has me LOL almost all the time. Thank you so much for your blog and the time you take with it. I can't imagine a day where I don't come on to read and get a little inspiration and l leave feeling a little bit sunnier!! I would love to win your year's worth of resources!! I follow your blog, TpT store, and facebook page. I also pinned your giveaway on Pinterest. Can you tell that I reeeeeaaaally want to win!! lol! :oD Thank you! I love all of your freebies and downloads-- I too strive to make math fun for my kids, so I love all the math games! Thanks so much for all your great ideas! I just convinced my grade level partner to check out the world of blogs with your blog! You rock! I love your Weekly Word Wizards and am a new fan of the Scoot games you are creating! Your site is amazing! I am a first year second grade teacher (although I have been teaching for 11 years) -- and I have been in awe of all of the creative and cool ideas you have presented!! I think your blog ROCKS! Thanks for all the great ideas and freebies!!! Thank you for inspiring, saving me time... and for improving the quality of my students' educational experience. Love all of your great ideas! Keep up the great work! Pinned your cute reindeer on my board! I love your blog! I would love to hear more personal narratives on your blog! Thanks for the great freebie! I love your blog. Such great ideas. I love your blog and follow you. Whenever I'm notified of your news, I always find great ideas to use in my classroom. Thanks for the opportunity to add to my curriculum. Love the reindeer repair kit! Pinned both your contest and the reindeer kit! I love the reindeer stuff! Its great to go with when we read Wild Christmas Reindeer. Im your newest follower! I love your blog and my students love your Bump! games. They are a staple in my classroom all year long! Love everything you make!! Thank you for sharing! 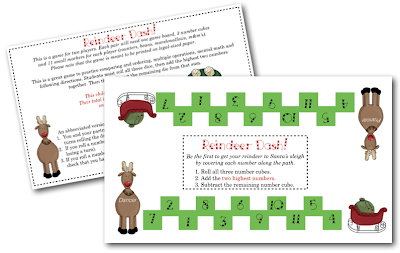 Love your blog and can't wait to use the Reindeer Dash game! Thanks for sharing! I pinned your reindeer on my teacher board! New Pals and New Pencils! TBA's 25 days of gifts!